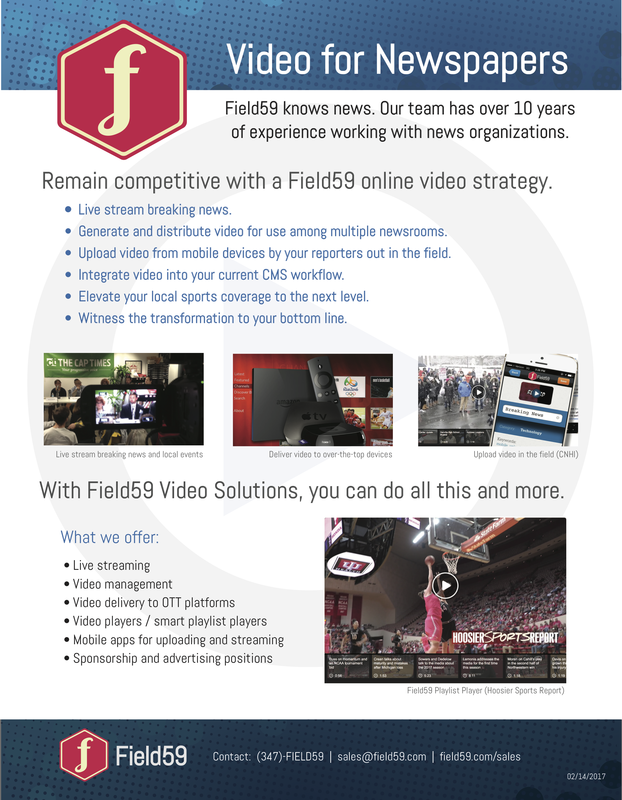 This article provides instruction on publishing Field59 video within the BLOX Content Management System by TownNews, including creating video content via the content syndication feed within the CMS, and via player embed codes copied from the Field59 Video Asset Manager. This guide is not intended to be a comprehensive guide to publishing content within the BLOX Total CMS and may not include all possible publishing workflows. To enable the ability to create or add video content via a syndication channel, you will first need to setup your Field59 content syndication feed in the CMS. From the drop-down in the the upper left choose Editorial -> Syndication. 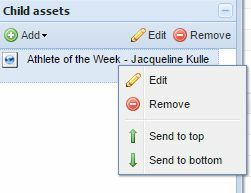 Open Application settings by clicking the gear icon in the upper-right corner of the admin desktop. Click on Field59 and click Continue. 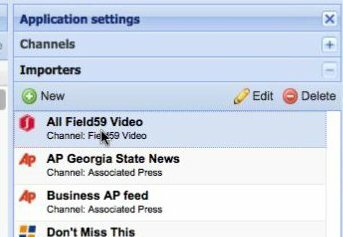 Provide a Channel name, your Field59 Username and Password, and optionally select a Workflow (if applicable — newsrooms using a Workflow would allow Field59 video assets created through this syndication channel to be managed within an existing newsroom workflow process). Finally, click Save. Please note the Field59 login used to set up the feed must have API access enabled. If you are unsure whether your account has API access, please contact Field59 support to have us enable or verify access on the login you wish to use for the syndication feed. 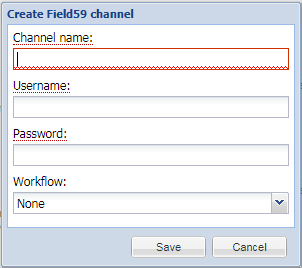 To verify successful channel creation, select Field59 from the list of available channels. The syndication feed should immediately begin to populate with content from your Field59 manager account. If successful, you are ready to begin publishing your video via the syndication channel. For additional information related to setting up your Field59 syndication channel, see the instructions on the TownNews help portal, or contact TownNews Customer Support. Once the content syndication feed has been created, you are ready to begin adding video to your website. Field59 video assets are pulled in as video assets in the BLOX Total CMS, and can be added directly to your site or attached as related content to a new or existing article asset. To import a video and add it to your site, navigate to your Field59 syndication channel. From the drop-down in the the upper left choose Editorial -> Syndication, then select Field59 from your list of available channels. 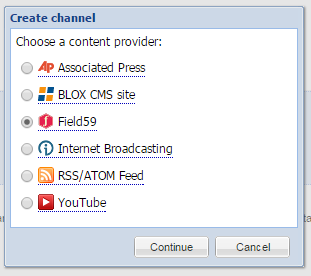 Your BLOX site may already have an importer set up to automatically import all Field59 videos available in your Field59 Syndication Channel. If not, you can manually import them. Check the box next to the video you wish to import, then click Add to site in the top-right corner of the panel. 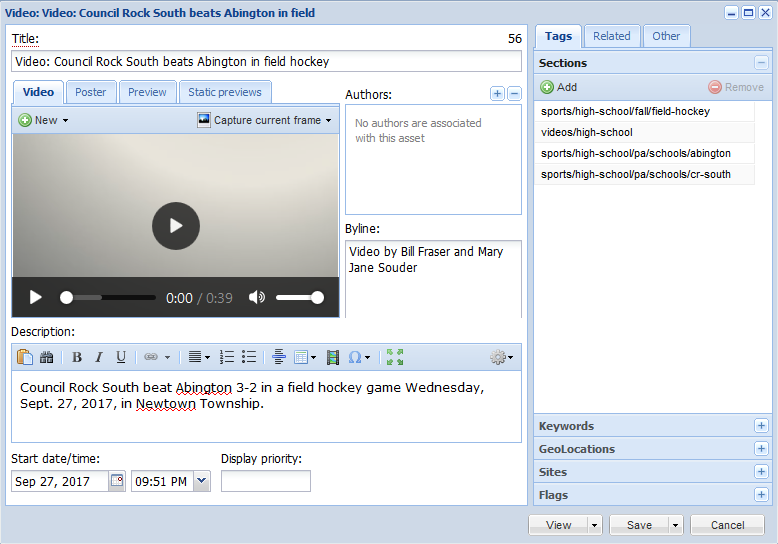 Alternatively, you can right click on the video to display an overlay menu, or double-click the item to load the video in the video asset editor panel. Select Add to site to create a video asset. The metadata you input into Field59 will automatically be carried with the video. Once created, on the video asset editor panel you can change any of your metadata, such as the title, description, targets, etc. for the video. You can also play the video inside BLOX. Click Save to publish the asset. 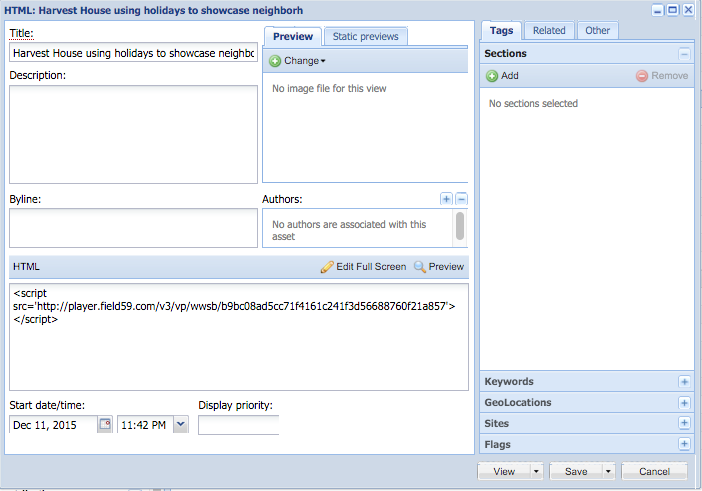 One way to add a video as related content to an existing Article asset is to add it from the Syndication channel. 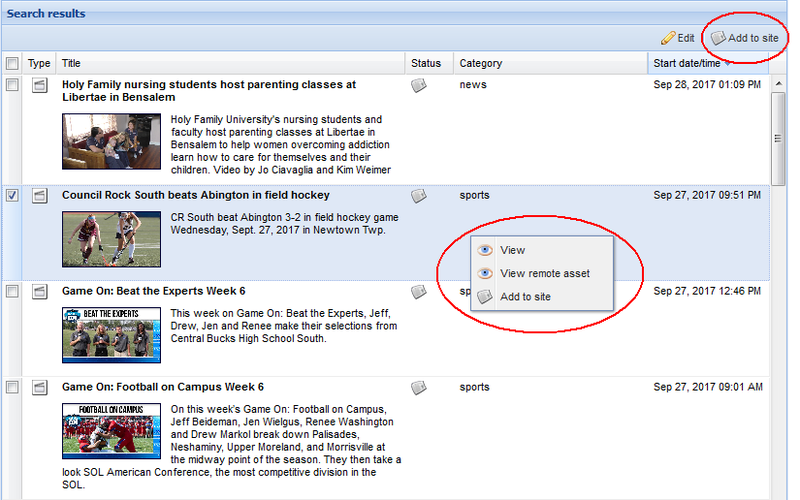 Open the article asset to which you wish to add video, click on the Related tab, then Add, and select From Syndication from the drop-down menu. Choose your Field59 syndication channel from the list of available channels, check the box next the video you wish to add, click Import and add, then Add to asset. When saved, the system automatically attaches it under the related tab. 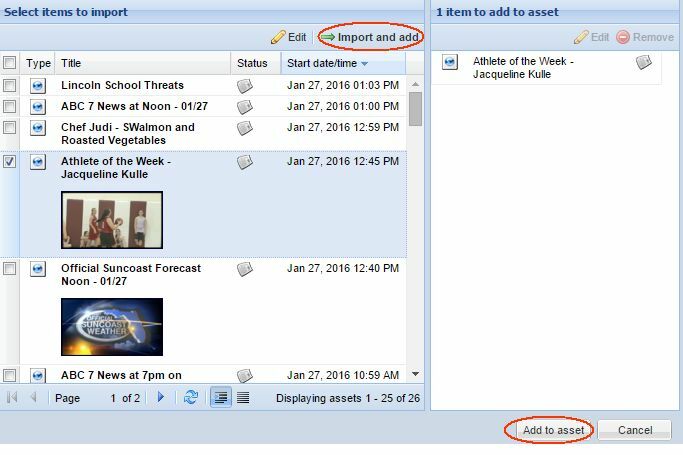 Once added as a related item, right click the item to reorder or edit the video asset. If the video has already been imported and is already a video asset in BLOX, click on the Related tab, then Add, and instead of From Syndication, select Find assets from the drop-down menu. 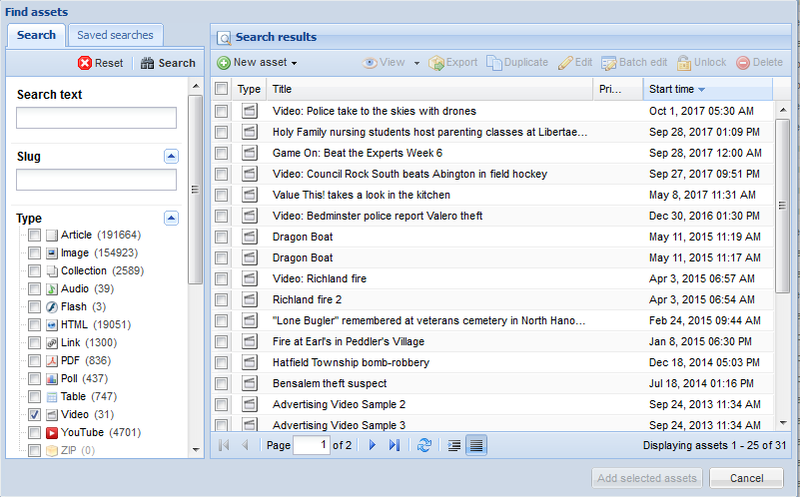 Filter your search by Type to Video to show your videos, which will by default order by most recent. Select the video(s) you want to relate, and click Add Selected assets. Videos may also be published to the BLOX CMS by copying a video embed code from the Field59 video asset manager, and pasting it into an HTML asset within the CMS. However, these assets will be created as HTML assets and display on your site with a paper clip icon rather than the video icon. It also does not come with some of the built-in functionality that the video asset in BLOX contains. For this reason, this workflow is less desirable than using the methods detailed above. Video embed codes are copied from the manager by clicking the gear icon located to the right of your video asset on the video index page and selecting Copy Embed, or by clicking the Embed button on a video editing page. To add a video to BLOX via embed, open the article asset to which you wish to add video. Click on the Related tab, then Add, go to More Editorial, and click on HTML. Another window will open. 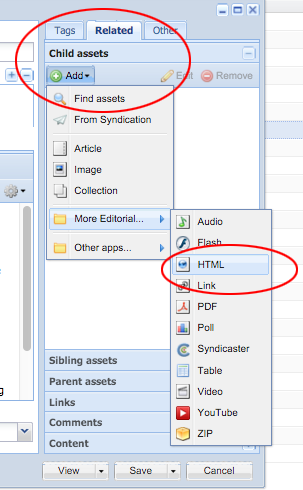 Paste the embed code from the Field59 video asset manager into the new HTML asset in the field labeled HTML. Give it a headline and click Save. 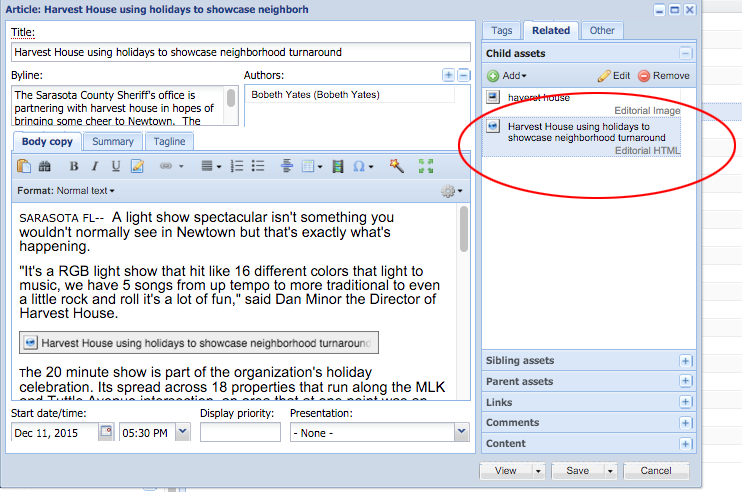 When it’s saved, the system automatically attaches it under the related tab of your Article asset. 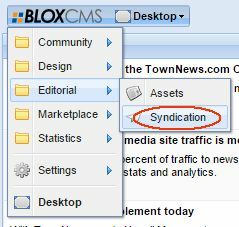 One other option you may want to utilize in Blox once you have created your Field59 Syndication channel is to set up an Importer to automatically create HTML assets in BLOX. This may streamline your workflow by allowing you to not have to go to the Syndication channel and click “Add to site” each time you want to associate a video with an article, or publish a video to a given section. Instead, the video would already exist as an HTML asset in Blox. Then click on Importers and locate your Field59 Syndication Channel. 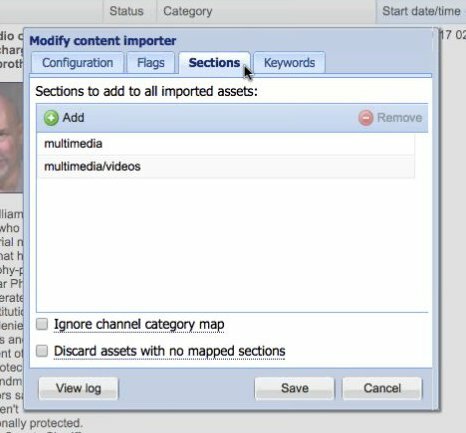 You can set videos to automatically target to a specific section, or add particular flags or keywords to the BLOX assets that are created, if desired. For additional information, please refer to the Field59 Syndication Channel, Video Asset (please note the video upload instructions detailed in that article do not result in your video being stored in your Field59 account at this time), and Importers help articles on the TownNews help portal. If you have been a Field59/BLOX customer from before September 2017, you may also find useful to review the announcement from 9/22/17 when BLOX updated the Field59 integration to use video assets.